We are excited to announce that the Jaliigirr Biodiversity Alliance has been selected as the winner of the 2016 Regional Sustainability Award at the NSW Green Globe Awards. Robin Heath, CEO Dorrigo Local Aboriginal Land Council and member of the Alliance stated at the awards ceremony held in Sydney on Thursday night “Working together benefits everyone – the Alliance is a great collaborative approach – we get more done to protect & restore country, and we raise awareness of cultural heritage values in the landscape”. 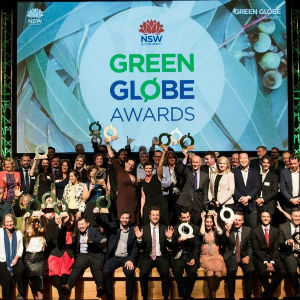 The NSW Government’s Green Globe Awards celebrate excellence, success and innovation in environment and sustainability. This award recognises our leadership action to protect and restore our natural landscapes – through the connections we have made with our partners and our community, and the results of working together to improve local biodiversity. The Alliance was established in 2012. It is a voluntary partnership encompassing Gumbaynggirr country from the Coffs Coast & Orara hinterland, through the Bellinger Valley and onto the Dorrigo Plateau, New England NP and the Upper Nymboida. The Alliance seeks to include the whole community through its partnership approach and recognises Aboriginal cultural attachment to our landscape as a key principle of its work. The alliance shares leadership and equity between its partners. It works through its partners to ensure that long-term conservation goals help people re-connect to each other and to the land. Craig Stehn, Jaliigirr Project Officer at Coffs Harbour City Council agrees that working together benefits everyone – ”Threats to biodiversity such as weeds and pests, don’t stop at property boundaries. The only way we can have a positive & lasting impact is by working together. The Alliance provides us with the framework for doing this and individual landholders can feel assured that they are part of a bigger team”. Jaliigirr is also part of the bigger picture as a member of the Great Eastern Ranges, a national alliance that seeks to protect 3,600 kilometres of Australia’s Great Dividing Range from the Grampians in Victoria to Cape York through “connecting people – connecting nature”.